Sinha is likely to be fielded again from his Patna Sahib constituency, where the BJP has fielded Union Minister Ravi Shankar Prasad. राहुल गांधी के साथ शत्रुघ्न सिन्हा. फाइल फोटो. 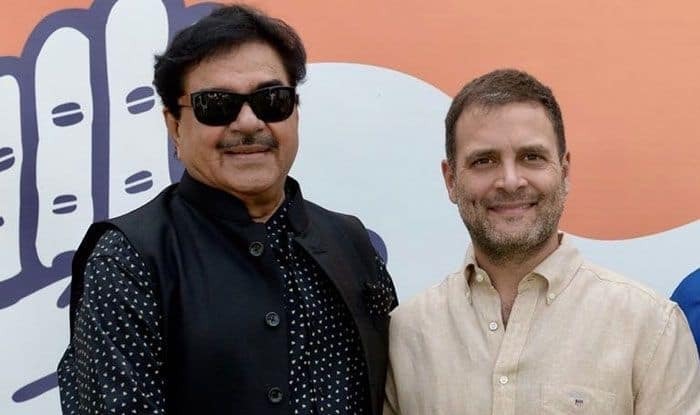 Rebel BJP MP Shatrughan Sinha, met Congress President Rahul Gandhi on Thursday and will formally join the party on April 6. “BJP MP Shatrughan Sinhaji … will formally join Congress on April 6,” Congress spokesperson Shaktisinh Gohil said in a tweet. Sinha is likely to be fielded again from his Patna Sahib constituency. The Bharatiya Janata Party (BJP) has fielded Union Minister Ravi Shankar Prasad from the seat. The actor-turned-politician has been critical of the style of functioning of Prime Minister Narendra Modi and BJP chief Amit Shah and accused them of running the country like an autocracy. He also slammed the BJP for denying ticket to party veterans LK Advani and Murli Manohar Joshi “without their consent”.